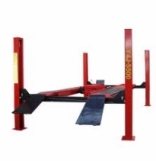 Whether you just like to tinker around with cars in your garage or if you are a mechanic with a full service garage, its in your best interests to have some sort of lift. How to go about choosing a four post lift for your garage can seem like quite a challenge if you've never had to look for one before. You will need to consider your budget and then look at what type of space you have available and then decide on what your needs are exactly. You may just need extra space for parking or you may be the car enthusiast who wants to be able to store and service several vehicles. There are a number of different types of lifts to choose from and choosing the right type and brand is not as difficult as it may seem. Assuming it's for home use for someone who is restoring cars, you may want to consider a four post lift. Even though a scissor lift may be easier to fit into your budget, it may be too small for the work involved in restoring cars. Some of the things you will need to determine are things like lifting capacity and maximum work space under the lift. Most lifts will range between 8,000 lbs. and 60,000 lbs. If you are doing restoration then you will want a four post lift with an open front for alignment work and full access to the undercarriage. Unless you have an enormous budget and / or a professional garage you will probably be looking for a surface mounted rather than in-ground lift. Once you decide on the big things like lift capacity you can look into the optional accessories like, oil drain pan kits, air / electric workstations, and rolling jacks. Finding the top brands of four post lift is easier than ever now with the use of the web. A simple Google search will direct you to a number of product review sites where you can find the top brands, like Dannmar, BendPak, Rotary, and Challenger. You can compare all the various features that are available as well as price compare.